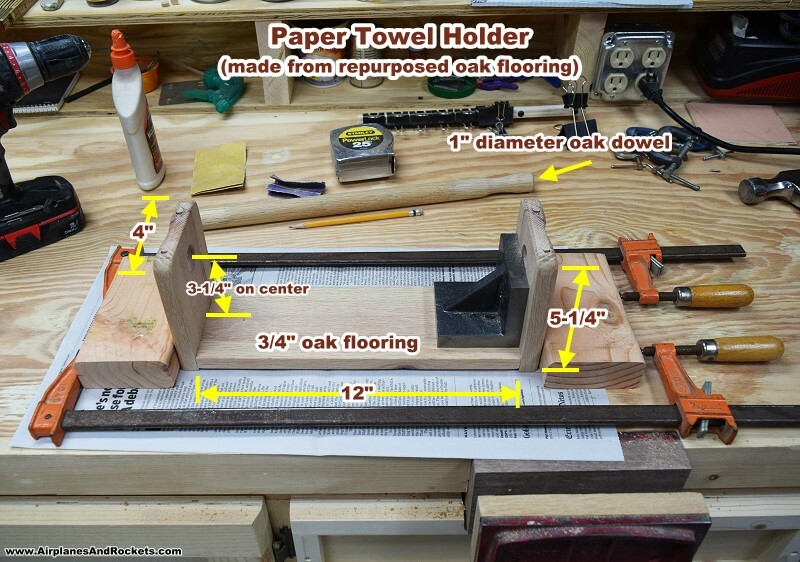 One of the first woodworking projects I remember doing after Melanie and I were married and in our own house was making a paper towel holder out of some scrap pieces of oak flooring. The wood was in the basement of the house, probably from when it was originally installed sometime in the 1950s. A few pieces were glued together along their tongue and groove edges, and then scraped and sanded to a smooth, flat surface. The bottom curved relief shape was retained for character. 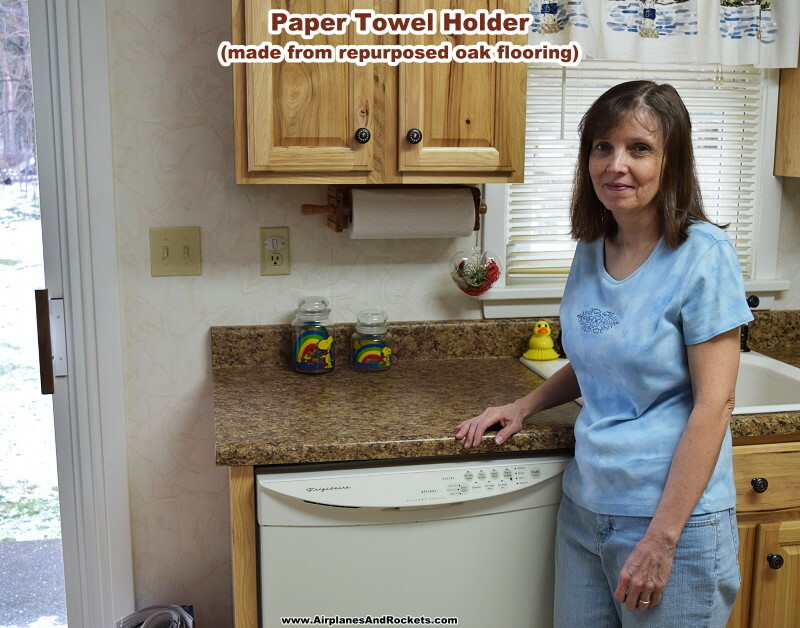 At some point during our many household moves, the paper towel holder disappeared - we probably donated it as with so many items while preparing to pack everything. Last December we decided to finally cut a set of stairs into the basement so that going through the garage would not be required. Our Erie house, also built in the 1950s, has oak flooring throughout, underneath the carpeting. Some day we will rip out the carpet and refinish the hardwood floors. The photo above shows Melanie prying off the flooring after I cut around the perimeter with a circular saw. It seems a shame to let all the good oak go to waste, so I built a replacement paper towel holder from some of it. 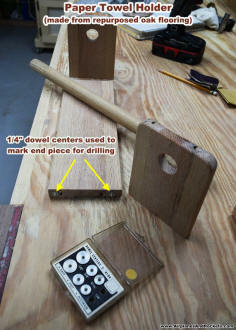 Since the floor boards are only about 2-1/2" across, it was necessary to glue a few together, just as with the original. 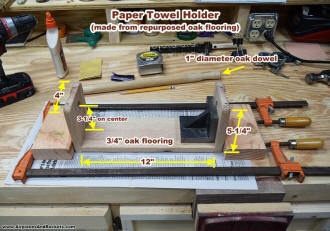 No plans were drawn for the paper towel holder project, but I did sketch it out first in the shop notebook. 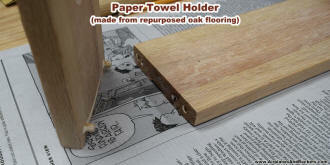 The size is based on the smallest size practical while accommodating a standard full paper towel roll. Dimensions are shown on the bottom photo. 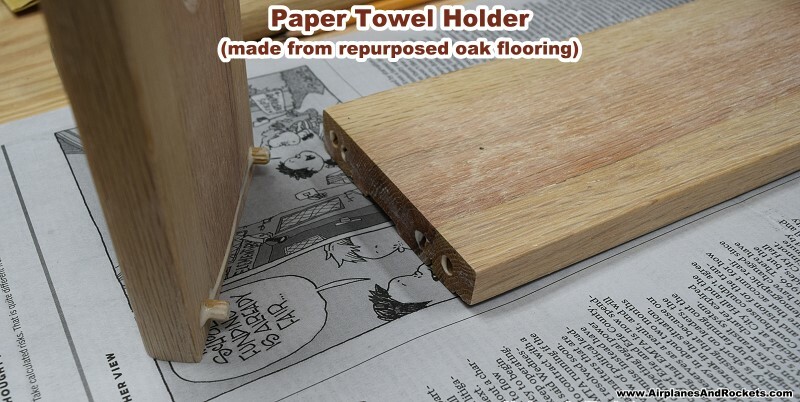 The original paper towel holder use a section of pine closet dowel for the axel, but this time I happened to have a piece of 1" oak dowel handy and used it since it's a better match to the oak flooring.